This Medieval costume is a multi piece costume, which consists of 5 garments that combine to make one outfit. 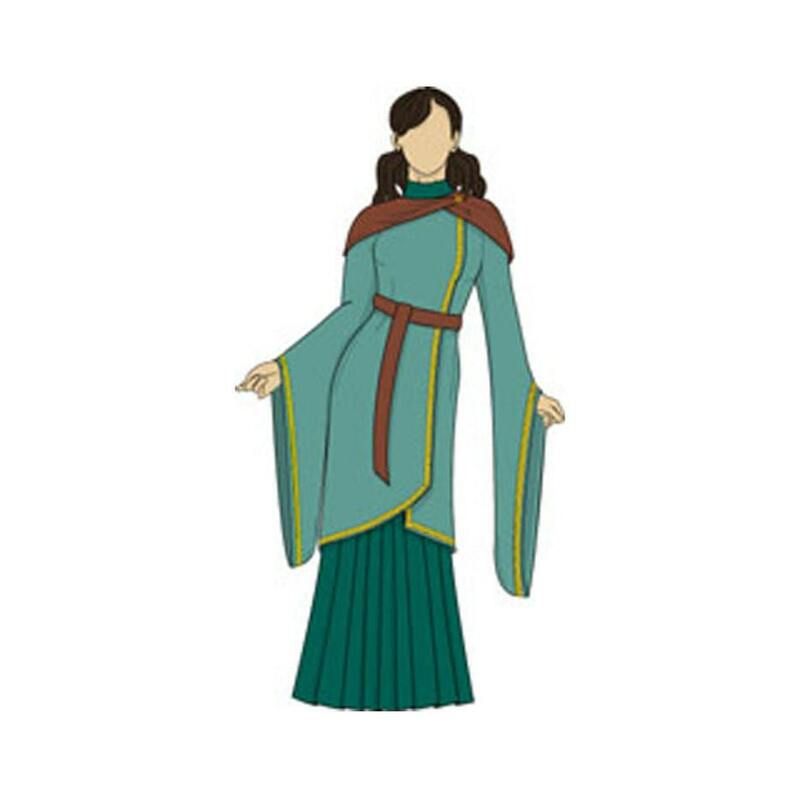 This is not true Medieval, in fact it's more of a cross between modern Oriental styling and 12th Century styling, producing a fabulous fitted Medieval style costume. The under skirt has an elasticated waist a very full hem, and is floor length. The under top, is a basic fitted to with a mandarin style collar and pointed sleeves, the fastening at the back is a zip, however you could always change this to any other type of fastening. The caplet is a short cape, which is shaped, and fastened with a press stud and decorative fastening. The main over dress features very full sleeves, an off centre opening, curved hemline and a decorative single closure. The over dress is a knee length dress. There is also a pattern included for the belt to go over the top of the over dress to keep it close, the belt is made from 2 parts and will require press stud fastenings. This dress will require an intermediate skill level of sewing, and an understanding of pattern markings. You will need to know how to insert a zip and apply facings. Full sewing instructions are included. Warning: This is a very large pattern and therefore will require a fair amount of paper for completion. For narrower fabrics please see notes on pattern. 3 or 4 press studs. The patterns included are size 8, 10, 12, 14, 16, 18, 20, 22 (see size charts). 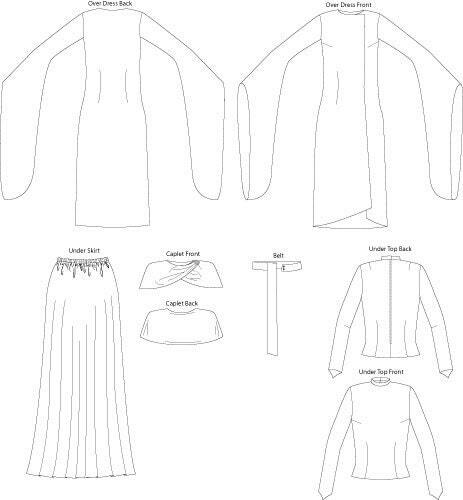 These are FULL SIZE patterns (this is an all in one/multisized pattern so you can adjust the pattern should you be an inbetween size, and cut the size you need).